"When the going gets tough, the tough get coffee"
Coffee is our big cycling compromise. We no longer travel with our clunky coffee mocha and have had to trade it in for this wonderful little Java Drip. It is small, compact and lightweight. 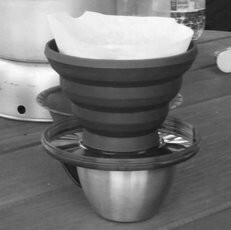 It is a little slow to drip and can only really handle one cup at a time, but it still makes a good cuppa coffee.